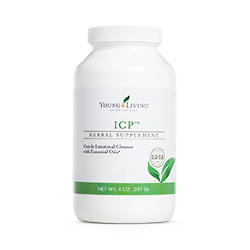 ICP Psyllium High Fiber Supplement contains essential oils and herbal cleansing ingredients. Rotate this with ComforTone to support healthy digestion and cleansing of the colon. Also contains fast acting enzymes that help break down protein and phytase an enzyme essential for vegetarians. Enzymes also help us absorb nutrients more efficiently from foods and supplements. A healthy digestive system is important for the proper functioning of all other systems because it absorbs nutrients that are used throughout the body. What Are the Benefits of Fiber in the Body? There are two kinds of fiber that the body requires: insoluble and soluble fiber. Insoluble cleanses the intestines of buildup on the wall while soluble fiber helps to absorb and release toxins from the body. A combination of both will ensure that a healthy digestive tract is functioning at its best; and assimilation of nutrients from food is optimal. This is an easy reference guide for ICP Supplement. It will tell you how to use it and what to use it for! Want to Purchase ICP Psyllium High Fiber Supplement? Purchase ICP Psyllium Supplement at The Oil Shop. Flax Seed (Linum usitatissimum) – Is a rich source of fiber and omega-3 fatty acids. Helps to scour intestinal walls. Oat Bran (Avena sativa) – binds with fat; provides healthy source of fiber. Fennel Seed (Foeniculum vulgare) – Supports healthy digestive system. Rice Bran (Oryza sativa) – A natural source of Vitamin E, antioxidants and minerals. Guar Gum Seed (Cyamopsis tetragonoloba) – Cleanses and supports healthy digestion. Yucca Root (Y. schidigera) – Cleanses and supports healthy digestion. Aloe Vera Leaf Extract (A. barbadensis) – Soothing to the digestive system. Cellulose – A toxin absorbing fiber. Enzyme formula (Lipase, Protease, Phytase and Peptidase) – Enzymes that help support the breakdown of fat and proteins; and help with the assimilation of nutrients. Lemongrass Essential Oil (Cymbopogon flexuosus) The Benefits of Lemongrass include supports healthy digestive system. Contains the naturally occurring constituent geranial. Ginger Essential Oil (Zingiber officinale)is supportive of the digestive system, ginger is commonly used to soothe, comfort, and balance digestive discomfort. Spicy and warm. Tarragon Essential Oil (Artemisia dracunculus) The Tarragon Plant and Essential Oil It is supportive to the digestive system and supports overall wellness. Anise (Pimpinella anisum) is used to support a healthy digestive system. What are the Documented Uses for ICP Psyllium High Fiber Supplement? Supports healthy digestive function and digestive system. Provides healthy addition of fiber. Fibers scour out residues in colon (large intestine). How do I use ICP Psyllium High Fiber Supplement? ICP provides three grams of soluble fiber and one gram of insoluble fiber per serving. How do I use ICP Psyllium High Fiber Supplement for Healthy Weight Loss and Management? ICP will maximize the efficiency of your digestive track by cleansing the digestive tract and allowing for optimum assimilation of foods. It also provides a good source of fiber which is lacking in processed food diets. For maximum healthy weight loss and management use with digestive enzymes, probiotic and Slique Oolong Tea along with exercise. Can this oil be used for Animals? Yes, use in small amounts. What are the Safety Precautions? Using this product without enough liquid may cause choking. Do not use this product if you have difficulty swallowing. Aloe Vera Leaf (A. barbadensis) is contained in this product. Read and follow directions carefully. Do not use if you have or develop diarrhea, loose stools, or abdominal pain. Consult your physician if you have frequent diarrhea. Purchase ICP Psyllium Supplement at The Oil Shop!